Physical chemistry lies at the heart of the behaviour of those macromolecules and molecular assemblies that have vital roles in all living organisms. Physical principles determine the stability of proteins and nucleic acids, the rate at which biochemical reactions proceed, the transport of molecules across biological molecules; they allow us to describe structure and reactivity in complex biological systems, and make sense of how these systems operate. 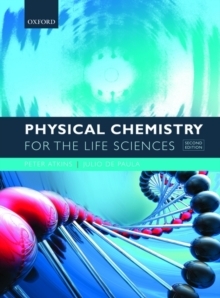 Physical Chemistry for the Life Sciences provides a balanced presentation of the concepts of physical chemistry, and their extensive applications to biology and biochemistry. It is written to straddle the worlds of physical chemistry and the life sciences and to show students how the tools of physical chemistry can elucidate and illuminate biological questions. Opening with a suite of chapters on Biochemical Thermodynamics, with a focus on energy conversion in biological cells and the factors that stabilize proteins, nucleic acids, and cell membranes, the book goes on to explore the Kinetics of Life Processes, examining the rates of chemical reactions, how rates can help characterise the mechanism of a reaction, and how enzymes affect reaction rates. A third section, Biomolecular Structure, looks at how concepts of physical chemistry can be used toestablish those 'rules' that govern the assembly of complex biological structures, while the final section, Biomolecular Spectroscopy, describes the major techniques in biochemistry that are being applied to help us to explore biochemical processes and systems ever further. Physical Chemistry for the Life Sciences places emphasis on clear explanations of difficult concepts, with an eye toward building insight into biochemical phenomena.